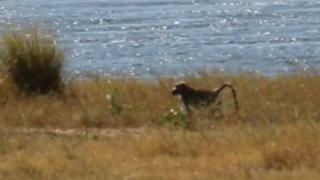 It has been three years since Robinson the baboon became stranded on an island in the Zambezi River. Despite rescue attempts by tourists and frequent calls from his family, Robinson doesn't seem to be going anywhere. I was standing on the deck of the Ruckomechi safari camp, gazing across the Zambezi River to the grey hills of the escarpment in Zambia, when my guide pointed at a non-descript island mid-stream - a low blur of vetiveria grass. "There's a baboon trapped over there," he said. "He's been there three years. We call him Robinson." I had come to Zimbabwe's Mana Pools National Park - for my money the prettiest on the entire continent - to file a story about the country's bid to attract more tourists. I'd met tourism minister Walter Mzembi - a favourite of President Robert Mugabe's and a man tipped by some for his job some day. I'd also met optimistic businessmen keen to attract foreign investment and I'd listened to conservationists pointing out that, without funding from Zimbabwe's cash-strapped government, tourist money was essential to fight the poaching gangs preying on the country's elephant herds. It was all compelling stuff. But an eight-year-old chacma baboon, trapped on an island for three years - that was a real story. In his former life, Robinson had been the alpha male in a troop of baboons living in the trees around Ruckomechi camp. He had a reputation as a bold thief - a robber baron adept at pilfering from the tourist tents lining the river bank. He had a harem of wives and a horde of kids. As the locals say: "LG" - life was good. But then he washed up on the island. No-one knows how the baboon was marooned. Some say he jumped into the river to escape lions or a predatory leopard. Others say he fell from a tree. One school of thought is that, with characteristic audacity, he simply walked across during the dry season when the river was particularly low. He's been isolated ever since. A slim, greying chap with his tail dragging despondently behind him, he subsists on a meagre diet of grass, roots and the occasional bird's egg. Most evenings his family come to the river bank and call to him - urging him, it would seem, to come home. But with crocodiles as large as 18ft (5.5m) guarding this African Alcatraz, an escape attempt would be suicidal. Zimbabwe's Parks and Wildlife Management Authority has banned any rescue operation, arguing that nature must take its course. But some tourists have defied the order. In the most recent attempt to save Robinson, a boat loaded with bananas was left moored on the island in the hope that the baboon's pilfering instinct would entice him aboard. The plan was to then cast off, trusting that Robinson's fear of water would be greater than his fear of humanity. But it didn't work. "He came, he had a long look at the boat, but in the end he simply walked away," says safari guide Honest Siyawareva. "Maybe his long incarceration has cured him of his criminal tendencies." Sooner or later, though, Robinson will either sink or swim. Upstream lies the Kariba Dam, and if a heavy rainy season means they have to open its sluice gates, Robinson's island will be submerged. But he may not be the only victim. The Kariba Dam is in a dangerous state. Opened in 1959, it was built on a seemingly solid bed of basalt. But, in the past 50 years, the torrents from the spillway have eroded that bedrock, carving a vast crater that has undercut the dam's foundations. Robinson has kept his head above water thus far because the authorities have been terrified to open the sluice gates. But engineers are now warning that without urgent repairs, the whole dam will collapse. If that happened, a tsunami-like wall of water would rip through the Zambezi valley, reaching the Mozambique border within eight hours. The torrent would overwhelm Mozambique's Cahora Bassa Dam and knock out 40% of southern Africa's hydroelectric capacity. Along with the devastation of wildlife in the valley, the Zambezi River Authority estimates that the lives of 3.5 million people are at risk. As the sun sets and I sit on the bank of the mighty Zambezi, the baboons come down to the water's edge and start calling. After a while, Robinson appears on the shores of his island. He sits and listens for a few minutes, then disappears back into the reeds. Maybe he knows that, with a map-changing catastrophe being held back by a 55-year-old crumbling wall just upstream, his prison island is as safe as anywhere round here.